Description: Screenprint in colours on Lenox Museum Board. Hand signed and numbered in pencil. Edition: 150; 30 AP; 5 PP; 5 EP; 3 HC; 1 BAT; 30 TP; 10 Roman numerals. Published by Ronald Feldman, New York, with the publisher's stamp verso. Printed by Rupert Jasen Smith, New York, with his blindstamp. Artwork is in excellent condition. Certificate of Authenticity included. 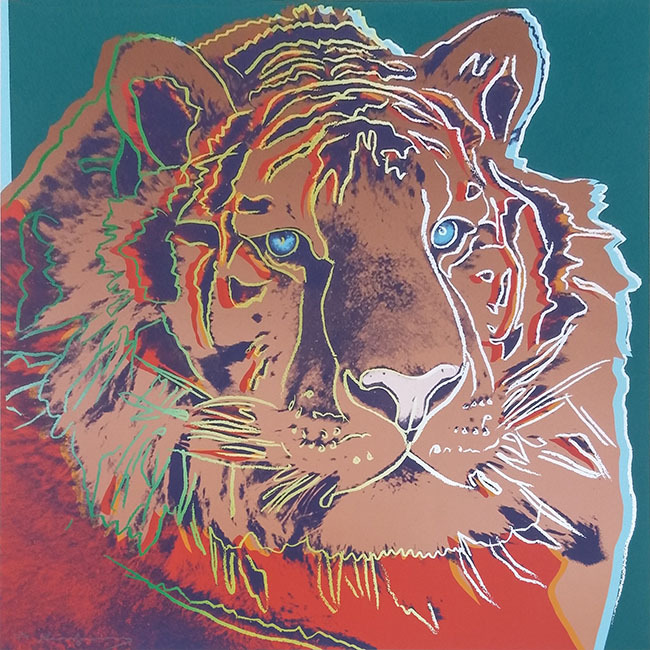 In 1983, Andy Warhol created a series of ten color screenprints that portrayed endangered animals from around the world: Siberian tiger, San Francisco silverspot, orangutan, Grevy's zebra, black rhinoceros, bighorn ram, African elephant, pine barrens tree frog, giant panda and bald eagle. Using brilliant colors -- characteristic of his signature style -- and poignant expressions suggestive of the animal's fate, Warhol creates a dynamic tension between art and reality. The Endangered Species portfolio was commissioned by Ronald and Frayda Feldman, long-time political and environmental activists who support innovative art projects and installations through their art gallery, Ronald Feldman Fine Art, New York. According to the Feldman's, the idea for the portfolio emerged after conversations with Warhol about ecological issues that included a discussion about beach erosion. Warhol was always interested in animals and when Ronald Feldman created the idea, the artist embraced it. Today, the loss of habitat and biodiversity are still hot topics as the impact of development reaches critical thresholds.